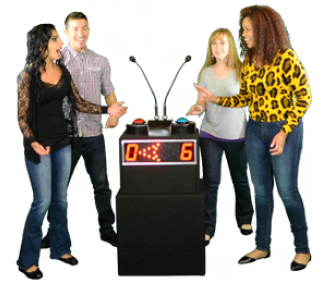 The Jeopardy style game show is an easy to operate, 4 player system, which allowing to keep score up to 95 points. Participants score in 5 point increments by answering correctly after “buzzing” in. 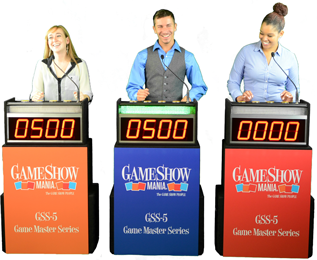 This unit allows up to four players to compete at one time. The games is played as followed. Step 1. Trivia Questions are read aloud by the Game show host/Emcee. Step 2. The Player with the quickest response buzz in by pressing the red button on the game board. Step 3. If the player is correct, the player receives points. However, if the player is not correct other players have the opportunity to buzz in for the correct answer. Incorrect answers lose points. Scoring is kept electronically by the game host and displays on the screen in front of the players. The game is played with 2 players face to face with their hands positioned over the game board button for quick response. Arrows highlighted with bright LED’s indicate which player has locked out and shows the audience who buzzed in first. LED scoring from 0-9 keeps track of the competition. You can have 2 teams of 4 players. Each player will alternating facing the opposer to score points for their team. The games is played as followed. Step 2. The Player with the quickest response buzzes in by pressing the red button on the game board. Step 3. If the player is correct, the player receives points. However, if the player is not correct other player have the opportunity to answer the question.